A lot of activity in the group is on analytical theory to make predictions for large-scale structure data. Image of a strong lensing time delay system, B1608+656, taken by the Hubble Space Telescope. The time delay between different images (labeled A,B,C,D) can serve as a probe of the geometry of the universe. 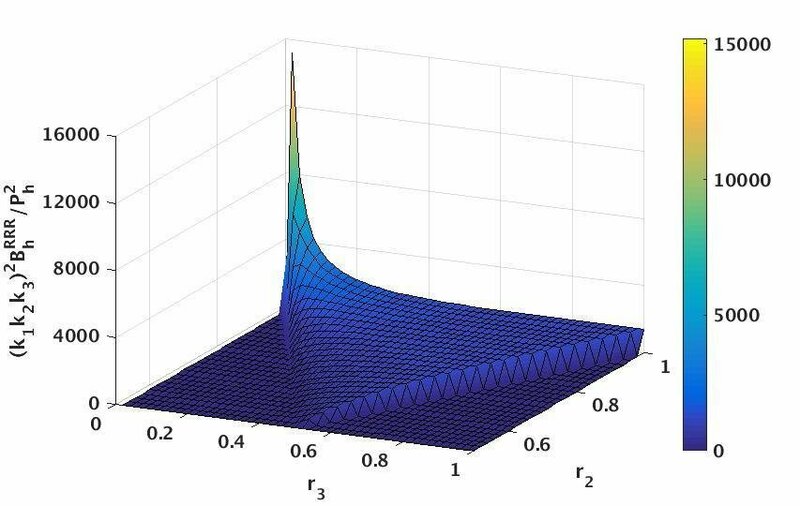 Large-scale perturbations (color code) modulate the structure formation on small scales (here, the matter power spectrum as function of wavenumber). This modulation depends on the history of growth in the universe, as well as on the initial conditions from inflation. Quantum fluctuations in the very early Universe give rise to temperature and polarisation anisotropies in the cosmic microwave background, and seed present-day cosmic structures. Primordial gravitational waves generated by these fluctuations carry information about the energy scale of inflation, and they are weakly non-Gaussian. However, primordial gravitational waves can also be generated by other sources, and carry imprints of the energy content of the early Universe. Scientists at MPA recently showed that these gravitational waves can be highly non-Gaussian, with a skewness much larger than for those generated by vacuum fluctuations. They concluded that non-Gaussianity is thus an important test of the origin of primordial gravitational waves. In the standard cosmological model, dark matter makes up roughly 25 % of the total energy budget of the Universe. However it cannot be observed directly, since it does not emit light. 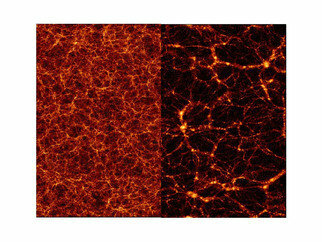 Understanding the way dark matter clusters together and forms structures is of crucial importance since it would help our understanding of the observed spatial distribution of galaxies (which should closely follow the dark matter distribution) and link this with early-Universe physics and the origin of initial perturbations. In this context, researchers at MPA and in other institutions worldwide came up with a new way of simulating the impact of large-scale primordial perturbations on the abundance of structures observed at late times, the so-called separate universe simulations. Using this technique, the MPA researchers recently obtained some of the most precise measurements of the local bias, confirming the known trend that more massive halos are more biased than smaller halos. The early acceleration, called cosmic inflation, happened when the universe was extremely young and extremely energetic. It generated the initial density fluctuations which eventually led to the formation of the structures in the Universe: galaxies, stars, planets, and ultimately, ourselves. The late-time acceleration has only begun fairly recently in the history of the universe, and is a great mystery since it happens on very large scales (at a very low energy scale). In fact, the energies at which these two epochs occurred are at least 15 orders of magnitude apart! The precise physical mechanisms of inflation and the late-time acceleration are not understood. What we do know is that physics beyond the standard model of particle physics is necessary. Learning about the physics of inflation corresponds to studying particle physics at energy scales out of reach of any current or future accelerators on Earth. On the other hand, if Einstein's theory of relativity is correct, the late-time acceleration means that there exists an additional exotic constituent (Dark Energy) in the energy budget of the Universe. Alternatively, the acceleration could signal that the theory of relativity is not a good description of nature on very large scales. We hope to gain insight into these difficult but fascinating questions by using data sets on the Cosmic Microwave Background (CMB, from the fairly early universe), and the large-scale distribution of matter, galaxies, and gas (from the late universe). We do this by calculating precise theoretical predictions linking models of inflation or dark energy with observations, and comparing them with the data. is interested in information theoretical aspects of Cosmology, in particular, how information is optimally extracted from cosmic microwave background and large scale structure data. For this, his group develops information field theory and applies it to cosmic measurements in all wavebands. tries to understand the physics of cosmic inflation, dark energy, and dark matter using laws of physics and state-of-the-art observational data on the cosmic microwave background, the large-scale distribution of matter, galaxies and gas, the clusters of galaxies, gravitational lensing, and the diffuse background light at various wavelengths. Planck is a European Space Agency’s satellite mission to map the full sky in nine microwave frequencies. The primary goals of the mission are to produce the most precise full-sky map of the temperature and polarisation of the Cosmic Microwave Background (CMB) and to detect hundreds of galaxy clusters via the so-called thermal Sunyaev-Zel’dovich effect. While the Planck mission has been completed, members of MPA are actively analysing the data to study the physics of the early universe using the CMB and the late-time universe using galaxy clusters. The Planck team members at MPA include Torsten Ensslin, Rashid Sunyaev, and Simon White. EUCLID is a planned European Space Agency mission to map the late-time Universe and unravel the nature of dark matter and dark energy. The mission will investigate the distance-redshift relationship and the evolution of cosmic structures by measuring shapes and redshifts of galaxies and clusters of galaxies out to redshifts ~2, or equivalently to a look-back time of 10 billion years. In this way, Euclid will cover the entire period over which dark energy played a significant role in accelerating the expansion. At MPA, Fabian Schmidt is member of the Euclid Consortium. The Sloan Digital Sky Survey (SDSS) has created the most detailed three-dimensional maps of the Universe ever made, with deep multi-color images of one third of the sky, and spectra for more than three million astronomical objects. Currently the fourth incarnation of the survey includes the Baryon Acoustic Oscillation Spectroscopic Survey (BOSS), which aims to provide measurements of the geometry and late-time expansion of the Universe with unprecedented precision. MPA is a full institutional member of SDSS. The Hobby-Eberly Telescope Dark Energy Experiment (HETDEX) is the first blind spectroscopic survey of millions of emission-line galaxies in the universe. HETDEX's instrument is called "VIRUS", and consists of 75 Integral Field Unit Spectrographs, each containing 448 optical fibers (i.e., more than 33,000 fibers observe the sky at any given time). VIRUS is mounted on the prime focus of the 10-meter Hobby-Eberly Telescope (HET) at McDonald Observatory in West Texas, USA. The spectral coverage of 350-550 nm with the resolution of R~700 enables us to detect a million Lyman-alpha emitting galaxies over z=1.9-3.5, and a couple million [OII] emitting galaxies in z<0.48. The expected starting date of the survey is in 2016. Eiichiro Komatsu is a member of the HETDEX collaboration and is leading the cosmological interpretation of the data for late-time cosmic acceleration, inflation, and mass of neutrinos. The Prime Focus Spectrograph (PFS) is a massively multiplexed fiber-fed spectrograph with 2400 moving optical fibers. It will be mounted on the prime focus of Japan’s 8-m Subaru telescope at the summit of Mauna Kea, Hawaii, USA. The instrument consists of three parts: blue, red, and infrared arms, covering a wide wavelength range of 380-1260 nm with the resolution of 0.3 nm. The primary science objectives of PFS include Extra-galactic science, Cosmology, and Galactic Archeology. For Cosmology, we will use [OII] lines to map the three-dimensional distribution of four million star-forming galaxies up to z=2.4, to study the late-time cosmic acceleration, inflation, and the mass of neutrinos. The survey area in the sky and the redshift range of PFS nicely overlap with those of HETDEX. The expected starting date of the survey is in 2019. The PFS team members at MPA include Torsten Ensslin, Guinevere Kauffmann, Eiichiro Komatsu, Thorsten Naab, Fabian Schmidt, and Simon White.